Venatia is a region of woodlands and hills nestled between the Klarkash Mountains in the west and the Great Yamas in the east. Once dominated by the Nomo Empire, it is now home to several competing city-states – Antigoon, the golden city, Blackpoort, the city of thieves, Lyonesse, the white city and ancient Ibis. Venatia has several sub-regions, including the Dreadful Woods, Forest Perilous*, Golden Coast, Golden Sea, Great Myre*, Harrowing Hills, Reed Sea, Rooky Wood*, Tepid Sea* and a small portion of the Wyvern Hills and Nabu Desert. * Does not appear on this map – wait for future installments. The Dreadful Forest is thick and dark, consisting mostly of evergreens (spruce, pine) and brambles. It’s primary inhabitants are the noroob and kobolds – hundreds of small copper and tin mines can be found beneath the forest. Orcs, goblin and ogres prowl the forest as well, and incursions by thugtoads and lizardmen are not uncommon in the forest’s western reaches. The Dreadful Forest is really the foothills of the Sturmdrang Mountains. It is bordered by the Forest Perilous to the north and the Great Myre to the east. Reptilians figure greatly into the ecology, for the whole forest was once ruled by the Lizard Kings, technologically advanced ancestors of the noroob and lizard-men. Lizardman ruins can still be found in the forest, along with some of their artifacts. Monster encounters should be diced for twice a day, once in the daylight hours and once at night. There is a 1-2 in 1d6 chance of a monster encounter. The monster encountered can be chosen from the list below or diced for randomly. KOBOLD – There are hundreds of small kobold mines in the Dreadful Forest. Many mineshafts are long since abandoned, the vein running dry and the miners moving on. For the most part, the kobolds mine copper and tin in the woods, with a few lucky groups finding silver, gold or precious stones. Kobold warriors wear leather armor and wield picks and short bows. For every 12 kobolds there is a 1 HD sergeant, for every 24 a 3 HD lieutenant and if more than 60 kobolds are encountered they are led by a 5 HD captain. For every sergeant in the band there is a 10% chance that they are accompanied by a 2nd to 5th level adept (see NOD #1) or magic-user. • Kobold: HD 1d4; AC 6 ; Atk 1 weapon (1d6); Move 6; Save 18; CL/XP A/5; Special: None. WOLF, REPTILIAN – An invention of the ancient Lizard Kings, reptilian wolves have the same statistics as normal wolves. The Golden Coast consists of a largee range of highlands bording the Golden Sea. The highlands are as rugged as those of the Wyvern Coast to the southwest, but receive more rainfall and thus support more vegetation. The coasts have the thickest woods, including forests of date palms, sycamores and pistachios. The hinterlands have smaller copses of bay laurels, hazels, lindens, maples and spruces. Animal life is also more plentiful on the Golden Coast, with the most common predator being a breed of lanky, golden-furred wolves. The highlands are also pocked with dozens of artesian wells and bubbling springs. They are rich in deposits of gold, copper, tin and zinc. During the Pandiluvian Age, the highlands of the Golden Coast were little more than small, scrubby islands in the what was then part of the much larger Tepid Sea. Many of the elder races established underwater mining operations in the highlands, traces of which can still be found today in irregularly shaped caverns filled with dark, dank deposits of primordial sea water and the descendants of the bizarre creatures that once inhabited those seas. As the waters receded, the highlands were settled by the chalkeions, a race of bronze-skinned men. The chalkeions built small settlements that gradually grew into small city-states and there honed the art of war and worshiped such gods as Sabazios, Hecate and Bacchus. At its height, the Nabu Empire conquered the city-states of the bronze men and reduced their numbers to the point that they would no longer be a threat to the empire and its ambitions, and the chalkeions remain few in number to this day. The Nabu left behind a few settlements of humans and beastmen (see Beastmen of Nabu in this issue). With the fall of the empires of Nabu and Irem, the elf-dominated Empire of Nomo expanded into Venatia, but never really came as far as the Golden Coast. A few adventurers established strongholds in the region, but the land remained wild and in the possession of the remaining chalkeions. 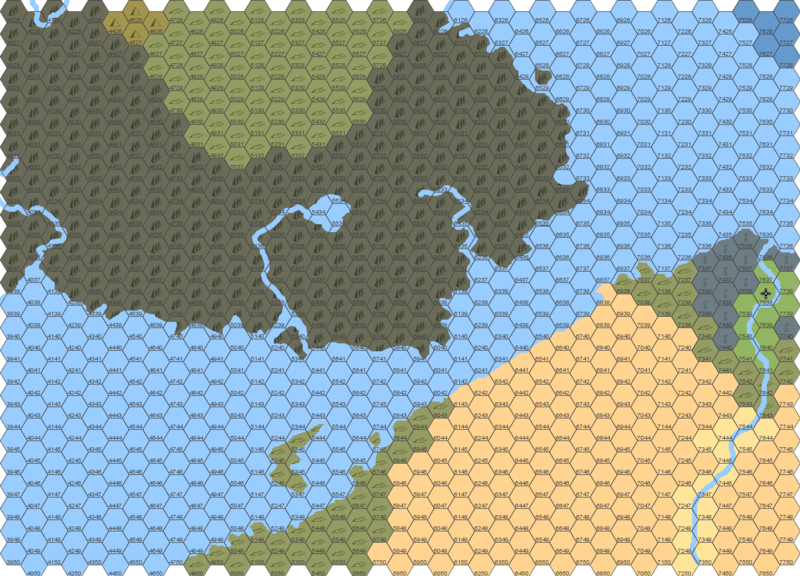 In recent times, the exiled dwarfs of the western continent have begun to establish mining operations along the Golden Coast. AIGOSY (Goat Men) – A large group of goat people might be a patrol or a caravan moving goods on the backs of allocameli. The warriors wear ring mail under black robes and carry shields, maces and slings. There is one 3 HD sergeant for every six warriors, one 5 HD lieutenant for every 12 and a 7 HD captain if more than 30 are encountered. There is a 10% chance per sergeant of a 2nd to 5th level aigosy (see “Beastmen of Nabu” in this issue). • Aigosy: HD 1; AC 5 ; Atk 1 weapon (1d6); Move 12; Save 17; CL/XP 1/15; Special: Climb, +1 save vs. mind-affecting spells, +2 save vs. disease and poison. ARC (Bear Men) – Arcs are usually encountered as a single hermit with the abilities of a 5th level fighting-man, monk or arc (see “Beastmen of Nabu” in this issue). The arc will be wearing a simple brown robe tied at the waist with a length of rope and carrying an earthenware jug on his shoulder and a large, gnarled club. • Arc: HD 5d6+10; AC 7 ; Atk 1 club (1d8+1) or 1 grapple (1d6); Move 12; Save 12; CL/XP 5/240; Special: +1 to hit and damage with club, +1 to hit with grapple, deals 1d6 damage per round while grappling, jug with 1d12 doses of cure light wounds. AXUM (Falcon Men) – The axum wander the hills in hunting parties of 2d6 individuals. The band will be led by a 4th to 6th level axum (see “Beastmen of Nabu” in this issue), fighting-man or ranger (see “Fighting-Men of Nod” in NOD #1 or “On the Fighting-Men of Nod” on the Land of Nod blog). The axum wear leather armor and carry curved long swords and daggers and a bundle of 6 javelins each. • Axum: HD 3; AC 7 ; Atk 1 weapon (1d8); Move 15; Save 14; CL/XP 3/60; Special: +1 to hit with missile weapons. CHALKEIONS (Bronze Men) – Usually a small party wearing hoplite armor and carrying spears, short swords and short bows. There is a 60% chance they will be mounted on warhorses. • Chalkeion Hoplite: HD 5; AC 2 ; Atk 2 by weapon (1d6); Move 12; Save 12; CL/XP 5/240; Special: None. DWARFS – Either a patrol of warriors wearing chainmail and carrying shields, axes and light crossbows or a small group of 4 to 9 prospectors. The patrol will have one sergeant for every 6 dwarfs, one lieutenant for every 12 and will be led by a captain if more than 30 dwarfs are encountered. There is a 5% chance per sergeant in the patrol of a dwarf druid. • Dwarf Warrior: HD 1; AC 4 ; Atk 1 weapon (1d8); Move 6; Save 17; CL/XP 1/15; Special: Detect stonework. • Dwarf Prospector: HD 3; AC 3 ; Atk 1 weapon (1d8); Move 6; Save 14; CL/XP 3/60; Special: Detect stonework. ESOU (Sheep Men) – The paranoid esou are encountered in large, well-armed groups that are either patrolling or on an important errand. The warriors wear chainmail and carry shields and maces. For every 6 esou encountered there is a 3 HD sergeant. For every 12 esou encountered there is a 5 HD lieutenant wearing platemail. If more than 30 esou are encountered, they are lead by a 7 HD captain in platemail. There is a 10% chance they are mounted on giant rams. There is a 5% chance per sergeant that they are accompanied by a 2nd to 5th level cleric of Onuris, a Nabu god of war. • Esou: HD 1; AC 2 ; Atk 1 weapon (1d8); Move 9 (due to armor); Save 17; CL/XP 1/15; Special: Only surprised on 1 on 1d8. GNOLLS – Gnoll war/hunting parties number 3d6 warriors. For every 6 gnolls there will be one sub-chief and if more than 15 gnolls are encountered there will be a chieftain. The gnolls are wearing leather or ring armor and carrying spears and bundles of javelins. There is a 3% chance per sergeant of a 2nd to 5th level adept (see “Wise Women & Cunning Men” in NOD #1, or “On Wise Women & Cunning Men” on Land of Nod blog). • Gnoll: HD 2; AC 5 ; Atk 1 bite (2d4) or 1 weapon (1d10); Move 9; Save 16; CL/XP 2/30; Special: None. The Golden Sea is a deep body of water that connects to the Tepid Sea via the Strait of Sabaz. Despite its depth, the Golden Sea is fairly calm, and much of the outer reaches of the sea is shallow, allowing easy navigation by galleys. The sea got its name for the deposits of gold on its shores and in its shallows. IBISIAN GALLEASS – The Ibisian navy patrols the Golden Sea in sleek galleasses. The ships are constructed from golden brown hardwoods and have brilliant yellow sails that bear crimson ankhs. The ships are armed with bronze cannon and always have a shipboard magic-user, usually of 3rd to 6th level and sporting an array of spells useful to naval combat. Issue #2 of NOD has rules for naval combat that Referees might find useful. LOCATHAH (Fish Men) – The locathah are a race of fish men who once dominated the Golden Sea. They have glassy black eyes and flesh reminiscent of a goldfish, with bits of pink and purple on their finger tips, toes and the tips of their arm, leg and back fins. Their numbers are now fewer, thanks mostly to the depredations of the shark-worshiping sahuagin. A locathah patrol will be armed with barbed spears and knives fashioned from obsidian or flint. For every 6 locathah, there will be a sergeant with 4 HD. For every 12 sahuagin, there will be a lieutenant with 6 HD. If more than 30 locathah are encountered, they will be led by a level 8 fighting-man. MERCHANT GALLEY – A merchant vessel with a single oar deck carrying about 2,000 gp worth of mundane cargo. The galley is crewed by six sailors and twenty rowers. They are commanded by a ship captain and first mate. The sailors are armed with light crossbows and axes, while the rowers can fight with clubs. Leaders wear leather armor and carry scimitars and daggers. • Sailor/Rower: HD 1; AC 8 ; Atk 1 weapon (1d8); Move 12; Save 17; CL/XP 1/15; Special: None. • First Mate: HD 3; AC 6 ; Atk 1 weapon (1d8); Move 12; Save 14; CL/XP 3/60; Special: None. • Captain: HD 5; AC 4 ; Atk 1 weapon (1d8); Move 12; Save 12; CL/XP 5/240; Special: +1 to moral checks, troops +1 to hit. PIRATE GALLEY – A pirate vessel with two oar decks, the galley is crewed by twelve pirates and thirty rowers. They are commanded by a ship captain and first mate. The pirates are armed with light crossbows and axes, while the rowers can fight with clubs. Pirate leaders wear leather armor and carry scimitars and pistols. There is a 1 in 6 chance of a mage being aboard. • Pirate: HD 2; AC 7 ; Atk 1 weapon (1d8); Move 12; Save 16; CL/XP 3/60; Special: +1 hit and damage in round 1, backstab for double damage. • First Mate: HD 3; AC 6 ; Atk 1 weapon (1d8); Move 12; Save 14; CL/XP 4/120; Special: Backstab for double damage. • Pirate Mage: HD 2d6; AC 8 ; Atk 1 weapon (1d4); Move 12; Save 16; CL/XP 3/60; Special: Two first level magic-user spells, backstab for double damage. The Harrowing Hills are a range of craggy hills that ring the river delta, forming a barrier between the Reed Sea and the Nabu Desert. The Nabu side of the highlands are barren, while the Reed Sea-side is more lush, though not as lush as the wetlands themselves. Beyond the river, the hills support, at best, tough grasses and thorny shrubs fit only for goats. In happier, more prosperous times, the hills were the location of dozens of villas owned by the nobility of Nabu. Most of these villas are now lost, but a few remain as villages occupied by the beastmen of Nabu. Most of the active settlements in the Harrowing Hills are along the canyon through which flows the River of Death. These hillside villas have terraced fields set anywhere from 40 to 60 feet above the level of the river. There are few landing sites on either side of the river, usually massive stone quays backed by sturdy, narrow temples chipped into the walls of the canyon. From these quays, dozens of little trails extend back into the hills, sometimes being constructed as stairs that ascend more than 100 feet before turning into well worn paths. These paths lead, in a twisting, indirect way, to the different villas, and from there into the hinterlands and a few scattered homes of goatherds. Most folk avoid the hinterlands, especially when the sun is highest, due to the visitations of the Sun Queen, a malevolent fairy queen who claims dominion over the hills. Her beautiful servants appear to travelers and laborers under the noonday sun and relieve from them the burden of life. The western hills are said to be home to an equally unpleasant earth dragon of considerable age. Ibis sends into the hills patrols of clockwork cavaliers in the shape of hawk-headed warriors in gleaming brass scale armor mounted on steeds that resemble brass hippogriffs. Largest native plant is a bush that grows as a clump of 3-ft long wooden branches covered in what appears to be a downy hair, but is actually tiny little leaves. From the end of these branches there drips a steady stream of sap that eventually forms a tear-shaped amber ball. When a branch is removed from the bush, ball-intact, it can be used as a mace, for the sap is quite hard and heavy and well-attached to the wood. These maces make a distinct whirring noise when swung about. If a hit with one of these maces causes maximum damage, the mace breaks. AIGOSY (Goat Men) – The goat people are sometimes found in large bands wandering the hills in search of mystic herbs and woods for use in their divinations, or else hunting down a predator that has recently struck their herds. They are armed in leather armor and carry javelins and spears. There is one 3 HD sergeant per 6, one 5 HD lieutenant per 12 and one 7 HD captain if more than 30 aigosy are encountered. For every sergeant there is a 10% chance of a 2nd to 5th level aigosy (see “Beastmen of Nabu” in this issue) or magic-user with the group. • Aigosy: HD 1d6; AC 7 ; Atk 1 weapon (1d6); Move 12; Save 18 (17 vs. mind effects, 16 vs. poison and disease); CL/XP B/10; Special: None. ARC (Bear Men) – A small number of arcs live in the Harrowing Hills. They are cave-dwelling hermits, but come together each year in the Spring to feast and play. If more than 1 arc is encountered, it is a sure bet that they are on important businesses. Arcs wear leather armor and carry large clubs and jugs of mead. • Arc: HD 3+3; AC 7 ; Atk 1 weapon (1d6+1); Move 12; Save 14; CL/XP 3/60; Special: +1 to hit when wrestling. AXUM (Falcon Men) – Axum encounters are either with a small band of exiles looking for a new perch, or with patrols from one of their lonely towers. In either event, they will be on foot and wearing leather armor beneath flowing white robes and tall white turbans, and wielding swords and long bows. There is one 3 HD sergeant per 6, one 5 HD lieutenant per 12 and one 7 HD captain if more than 30 axum are encountered. There is a 1 in 6 chance the captain is a ranger or has levels in the axum class (see “Beastmen of Nabu” in this issue). • Axum: HD 1; AC 7 ; Atk 1 melee weapon (1d8) or 2 missile weapon (1d8); Move 15; Save 17; CL/XP 1/15; Special: None. BANDITS – This is a band of human bandits preying on the few merchant ships and caravans that travel through the hills. They will be a desperate lot in leather armor and armed with spears and short bows. For every six bandits there will be one sergeant with 3 HD. For every 12 bandits there will be a lieutenant with 5 to 6 Hit Dice. If more than 30 bandits are encountered, they will be led by a captain who is a level 7 or 8 fighting-man. There is a 3% chance per sergeant encountered of a magic-user of 2nd to 5th level, and a 3% chance of a cleric of 2nd to 5th level. • Bandit: HD 1; AC 7 ; Atk 1 weapon (1d8); Move 12; Save 17; CL/XP 1/15; Special: None. ESOU – The esou of the hills usually inhabit abandoned human villas. They send out many patrols, and these patrols usually react with hostility to strangers. Esou warriors wear chainmail and carry shields, spears, short swords and light crossbows. There is one 3 HD sergeant per 6, one 5 HD lieutenant per 12 and one 7 HD captain if more than 30 esou are encountered. There is a 1 in 6 chance the captain is a fighting-man or has levels in the esou class (see “Beastmen of Nabu” in this issue). KAWA – A merry band of kawa can be a sight for sore eyes in the Harrowing Hills. Hunters by trade, they have little to steal and thus little to fear from others. Although kawa are initially wary of strangers, they will parlay and after an exchange of gifts will show hospitality. Kawa warriors wear leather armor and carry short bows and short swords. There is one 3 HD sergeant per 6, one 5 HD lieutenant per 12 and one 7 HD captain if more than 30 kawa are encountered. There is a 1 in 6 chance the captain is a ranger or has levels in the kawa class (see “Beastmen of Nabu” in this issue). • Kawa: HD 1; AC 7 ; Atk 1 weapon (1d6); Move 12; Save 17; CL/XP 1/15; Special: Surprise. MOULAJ – The moulaj are encountered in small bands in search of treasure to loot. They will make every attempt to hide from or avoid adventurers, but may tail them in the hopes of being led to a loot. The moulaj wear black robes over their leather armor and carry daggers, light crossbows and short swords. They are led by a 3rd to 6th level cleric/thief or moulaj (see “Beastmen of Nabu” in this issue). • Moulaj: HD 1d6; AC 7 ; Atk 1 weapon (1d6); Move 12; Save 18 (17 vs. undead); CL/XP 1/15; Special: Cast one level 1 cleric spell per day plus see above. QAMOULI – Qamouli encounters are always with a band of traders and their families. As a group, they are easy to spot in their yellow robes and tall, crimson turbans, holding their long spears decorated with gleaming holy symbols. The qamouli are among the friendlier races in the hills. Each band is led by a 4th to 7th level venturer (see NOD #2) or qamouli (see “Beastmen of Nabu” in this issue). • Qamouli: HD 2; AC 7 ; Atk 1 weapon (1d8+1); Move 15; Save 16; CL/XP 2/30; Special: See above. RIRI – Riri treasure hunters comb the hills for hidden shrines and tombs of the ancient Nabu. They are standoffish and encounters with them can quickly turn violent if they fear adventurers are after their treasure. Offerings of intoxicating drink can soften them up, but one must take care not to wait around form them to become drunk, for drunk riri are as dangerous as suspicious riri. The warriors wear ring mail and carry shields and axes. There is one 3 HD sergeant per 6, one 5 HD lieutenant per 12 and one 7 HD captain if more than 30 riri are encountered. There is a 1 in 6 chance the captain is a thief or has levels in the riri class (see “Beastmen of Nabu” in this issue). • Riri: HD 1+1; AC 4 ; Atk 1 weapon (1d8); Move 9; Save 17; CL/XP 2/30; Special: Fight until -5 hit points. SUN QUEEN – On very rare occaisions, travelers through the hills encounter the Sun Queen and her court. The Sun Queen is a powerful fey accompanied by three Lady Middays and nine golden lions. Encountering the Sun Queen almost always means death. The Sun Queen appears as an 8-ft tall woman with white skin (actually white hot skin) and flaming hair. Her thin, angular body is unclothed. • Sun Queen: HD 12 (70 hp); AC 2 ; Atk 1 slam (1d8 + 1d6 fire); Move 15; Save 3; CL/XP 14/2600; Special: Aura of heat inflicts 3d6 damage within 5 ft, 2d6 damage within 10 ft and 1d6 damage within 30 ft, immune to fire, her aura of heat and touch cause confusion in those who fail a saving throw. • Lady Midday: HD 4; AC 3 ; Atk 1 shears (1d4+2 plus 1d6 fire); Move 12; Save 13; CL/XP 8/800; Special: Burning touch, confusion, dark sensitivity. • Golden Lion: HD 5+2; AC 4 ; Atk 2 claws (1d4), 1 bite (1d8); Move 12; Save 12; CL/XP 6/400; Special: Body gives off tremendous heat, causing 1d6 damage to all within 10 feet, immune to heat and fire, double damage from cold. The Reed Sea is a vast wetland, the river delta of the River of Death. The delta consists of rich, sandy soil criss-crossed by thousands of smalla and large water courses, all of them choked with papyrus plants. The delta supports a rich variety of plants and animals, including olive, qumquat and silver beech trees, dozens of berry-producing shrubs and such animals as silver foxes, ibis, ducks, eagles, water rats, serpents and a unique variety of leaping cattle called the Nabu Blue that have long horns that sweep back from the head, in the manner of an antelope, narrow faces and bodies and blue-grey coats with white spots on the haunches. The largest settlement on the Reed Sea is Ibis, an ancient port of Nabu that survived the empire’s downfall largely intact. Since the fall of the empire, Ibis has prospered as both an independent city-state (as it is now) and as a far-flung colony of Nomo. Ibis is surrounded by hundreds of manorial villas and boasts a fine university. As in the days of old, it is ruled by a wizard king, the scion of a long and storied dynasty. Monster encounters should be diced for twice a day, once in the daylight hours and once at night. There is a 1-3 in 1d6 chance of a monster encounter. The monster encountered can be chosen from the list below or diced for randomly. CLOCKWORK CAVALIER – See Harrowing Hills above. MEN-AT-ARMS – This represents a patrol from Ibis. Half of the patrol is light infantry wearing leather armor and carrying shields and spears. The other half are archers wearing leather armor and carrying short bows and short swords. Patrols sometimes ride on skiffs, but are usually on foot. For every 6 men-at-arms there is a sergeant-at-arms, for every 12 a 5th level fighting-man and if more than 30 are encountered they are led by a 7th level fighting-man. For every sergeant present there is a 5% chance of a 2nd to 5th level cleric accompanying the patrol. QAMOULI – See Harrowing Hills above. TRADER – A band of traders either employs shallow barges to move goods or else is leading a camel caravan. Not sure if I mentioned the Klarkash Mts before, or not. CAS is one of my main inspirations, so his spirit had to show up in Nod eventually.